Scorching temperatures broke heat records around the world last month, which ranked as the fourth warmest July on record. Excessive warmth during the first seven months of 2018 made it the fourth warmest year to date for the planet. The average global temperature in July was 1.35 degrees F above the 20th-century average of 60.4 degrees. This was the fourth highest for July in the 139-year record (1880–2018). Last month was also the 42nd consecutive July and the 403rd consecutive month with temperatures above average. The year-to-date average global temperature was 1.39 degrees F above average of 56.9 degrees. This is 0.48 of a degree lower than the record high set in 2016 for the same YTD period. The globally averaged land-surface temperature was fifth highest on record for July and the fourth highest for the YTD (January–July) period. The globally averaged sea-surface temperature was sixth highest on record for July and the fourth highest for the year to date. Areas around the world experienced record warmth, including Scandinavia and the surrounding Arctic Ocean, northwest Africa, parts of southern Asia and southwest United States. Europe had its second-warmest July on record. 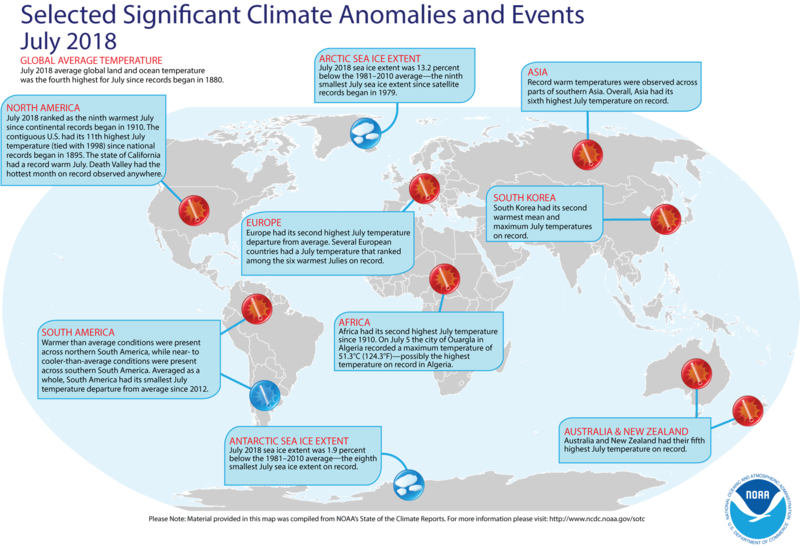 Record warm YTD temperatures prevailed across parts of the world’s oceans and Mediterranean Sea, New Zealand, as well as smaller areas of North and South America and Asia. Africa, Asia, Europe and Oceania had TYD temperatures that ranked in the sixth highest on record. The average Arctic sea ice coverage (extent) in July was 13.2 percent below the 1981–2010 average, making it the ninth-smallest extent for July on record. The Antarctic sea ice extent last month was 1.9 percent below average, the eighth smallest on record for July. Antarctic sea ice coverage did expand at a rate faster than average during the first half of July, but slowed later in the month.